East GalleryNUA will be the first art gallery venue worldwide to exhibit Mutator VR, a new Virtual Reality installation using original software modelled on the processes of evolution from Tuesday 15 November 2016 to 14 January 2017. Created by artist William Latham with mathematicians and software developers Stephen Todd and Lance Putnam, Mutator VR blends organic imagery with state-of-the-art, real-time computer animation to create a highly immersive and original audience experience. Resembling life forms from an alternative or even alien evolution, ‘Organic Art’ was originally developed in the late eighties by William Latham and Stephen Todd and this approach has led to the emergence of forms in virtuality, immersing the viewer in a super-surreal world of interactive evolving forms. 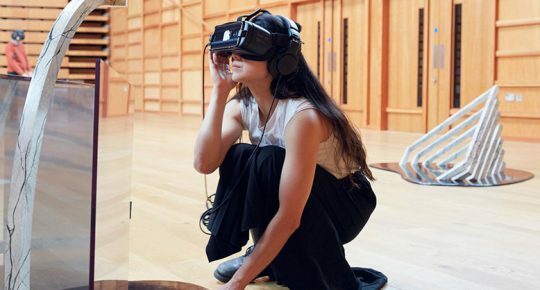 In East GalleryNUA the viewer will experience the work as an immersive visual and sound experience by wearing a HTC Vive VR Headset and will be equipped with two hand controllers to conduct the evolution of the artwork. William Latham studied at Oxford University and the Royal College of Art and started developing organic computer based art in the 1980s. From 1987- 1993 worked as a Research Fellow at IBM Scientific Centre, Winchester during which time his work was shown in solo exhibitions at Arnolfini Gallery, Bristol, the Natural History Museum, London and the O Art Museum, Tokyo, to name but a few. Latham began working with mathematician Stephen Todd in the 1990s, researching the potential for computer algorithms to generate organic imagery and evolve that imagery with the guidance of the viewer. Since 2007 Latham has been Professor of Computing at Goldsmiths, University of London and has recently developed his ‘Mutator’ into a Virtual Reality format. This has been achieved with research assistant, Lance Putnam whose own interests lie with the fusing of computer art and sound. Mutator VR was developed at Goldsmiths (University of London), The Digital Creativity Labs and The Christchurch Studio, Winchester.